We’d love your help. Let us know what’s wrong with this preview of Welcome to Mistywood Lane by Reon Laudat. Plan A: Get engaged by year’s end. Book ballroom at the Whittington Hotel for dream wedding and reception. Cupcake baker Reese Sommers thinks she’s met Mr. Right, but the night he's supposed to pop the question, his enraged fiancée pops up instead. Plan B: Take time to heal broken heart. No men! Focus on family, friends, feline, finances, and franchises. Take the Sweet Spo Plan A: Get engaged by year’s end. Book ballroom at the Whittington Hotel for dream wedding and reception. Plan B: Take time to heal broken heart. No men! Focus on family, friends, feline, finances, and franchises. Take the Sweet Spot Bakery-Coffee Shop to next level. The next day an incredibly handsome and charming stranger moves to Mistywood Lane. Gabriel Cameron buys the house next door to Reese. Their sizzling chemistry requires revising her list. Plan C: Family, friends, feline, finances, franchises...and a fling. Hmmm, a little no-strings fun with Mr. Right Next Door? Just the sweet distraction needed. No falling in love, only "in like." 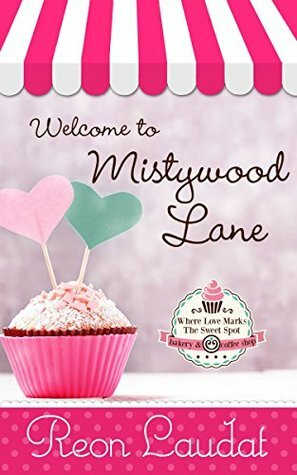 To ask other readers questions about Welcome to Mistywood Lane, please sign up. I loved the story here. Pages of information Sith a developed story line. I can't wait to read the next book. Gabriel and Reese had a great chemistry. Read this. This was a breath of fresh air. I just loved this story. All the characters were great. A very great read. This is the first book that I have read by Reon Laudat. The story was quirky and funny. I really enjoyed the book. It was great to see Reese finally stand up for herself and stop being a pushover. I liked her and Gabriel together. I'm glad they were able to work things out. I also liked Reese's relationship with her sisters Quinn and Blaire. Hoping to see more stories from Mistywood Lane.